'An Everyday Story of Country Folk' . . . 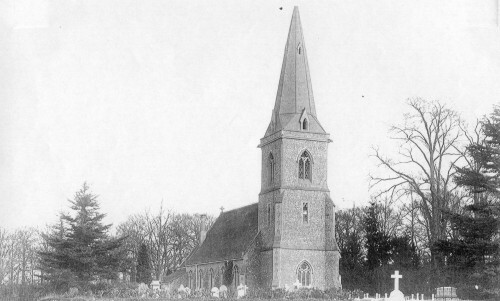 There is a Minute Book of Arborfield Parochial Church Council covering the period from 1935 to 1954, during which period there were major changes in the life of the village. The Second World War brought its own changes and the Post-war period changed people's aspirations; meanwhile, these and other pressure caused the estates of Arborfield Hall and Newlands to be broken up. This trawl through the Minute-Book identifies the key figures and issues raised over this period. The Parochial Church Council is the governing body of the church. It has no formal connection with the Parish Council, though there have been members serving on both at the same time, and Canon Anderson chaired both for many years. The Annual Meeting of the PCC for 1935 was held on 10th March in the relatively new Village Hall, which confusingly is situated in what was the civil Parish of Newland and the ecclesiastical Parish of Bearwood. At that time, the Electoral Roll stood at 155. Who were the elected members of the PCC? Messrs. Allsebrook, Allen, Guy Bentley, Barker, R Brean, Cox, Simonds, Thomas, Verrall; Mrs. Anderson, Williamson, Prescott, Lyford, Smith; Misses Jervoise, Druett and A M Edwards - PCC Members. Subsequent PCC meetings were also held in the Village Hall, and at the first, on May 1st, Miss Simonds was co-opted as a member. The usual business was finance (annual expenditure was around £200), and maintenance of both the church building and the forms of worship, with prayer normally minuted at some stage in the proceedings. However, the big discussion this time was about a service to take place on Jubilee Sunday, May 12th. A Legion Parade was to take place in the evening, plus a short service on the Sports Ground. Later that year, the PCC discussed plans for a Senior Church School to be built in Wokingham. The next year PCC was concerned about the state of the Old Church and Churchyard, which was far from satisfactory. The Berks Archaeological Society had suggested and recommended certain repairs to preserve the ruins at a cost of about £70 - which was beyond the means of the PCC. They decided to approach the Local Authorities for help. A later meeting agreed that the ivy should be trimmed and certain repairs done. Also in 1936, Miss Vincent's offer to provide a stained glass window in memory of her parents. This was accepted, and the PCC agreed the precise form of words necessary to obtain a 'faculty' from the Diocese to have the works completed. The Old Church continued to occupy the PCC's agenda in 1937. They made a claim to the Parish Council for £3 for maintenance while more long-term plans were being drawn up. Another big occasion was special services for the Coronation, including a short service on the Sports Field. Mrs Williamson had offered to install electric light in the Chancel as a Coronation gift. Power was to be by portable batteries, which presented a practical problem - how to transport the batteries and charge them? Meanwhile, at the Old Church, Mr Allsebrook reported that trees on his property had broken the wall round the Churchyard, and he sought permission to lower the wall in repair. By October, a more immediate threat was woodworm in the Organ; both the manuals and the frame were affected, and so these needed complete replacement, including keyboards. At the same time, Mr T H Allen, who had been Organist and Choirmaster for 25 years, felt he should resign because of his health and increasing years. Over at the Old Church, the wall had been lowered, while an estimate had been received for necessary repairs to the Old Church. The mortuary chapel was in a bad state, and the Hargreaves family were to be advised of the proposed demolition. 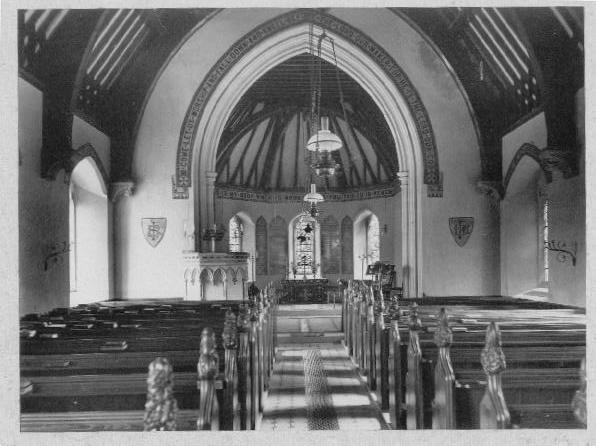 By February 1938, the Church building had been improved by the repairs to the Organ at £43, a new carpet in the Chancel donated by Mrs Prescott and the electric lighting in the Chancel. A new Organist and Choirmaster had been appointed, namely Mr G St Clare Collis. Looking outwards, a new Missionary Committee was formed. In 1939, a Faculty had been obtained to transfer the Standen Monument and Tablet from the Old Church. Mr Collis reported on the condition of the Organ, which he felt would need to be completely rebuilt within a few years. The Council was asked its opinion whether the Choir should sit in the Chancel rather than in the Nave, but this was deemed to be difficult both because of the size of the Choir, and because of the acoustics in the Chancel. Mr J A H Simonds had taken on the role of Churchwarden and Treasurer some years before, after Mr Carter had left the Parish. Now it was Mr Simond's turn to move away, and his position was filled by Mr J H Simonds. Although there was no mention of the impending War, a letter was read at the meeting on February 15th 1939 from the Bishop, asking whether people could offer temporary accommodation to one or more refugee Jewish children from Germany. However, the PCC didn't feel that they were able to help in this way. Reports had been received from various Organ builders - Walkers, Willis, Gray & Dawson and Hill's - concerning repairs. All mentioned dry rot and woodworm. The Organ was past repair, but the pipes and some of the stops could be salvaged, Rebuilding would cost around £1000. Woodworm had also infected joists under the floor where the Standen Monument was to be sited, plus another area that was inspected. Over at the Old Church, Wokingham RDC had pointed out that Arborfield Parish Council was responsible for the care of the Old Churchyard, and were undertaking repairs to the boundary wall. At the 1939 Annual Church Meeting, Canon Anderson reported that the Afternoon Sunday School had been discontinued due to lack of helpers, but the Morning Sunday School was being continued with Miss Jervoise and Miss Mary Simonds as teachers in place of Mrs Anderson and Miss Bentham. Numbers at both the morning and evening congregations were declining. The April meeting reported a deficit in funds, which put everything on hold. The Church Floor was not in immediate danger, so work was deferred. Also, although the Reading Mercury had reported that the Berks Archaeological Society's recommended action on the Old Church was due to take place, this wasn't the case because there were no funds available. As it was, Mr Allsebrook at Arborfield Hall asked whether he could remove some trees in the Old Churchyard and the income from the timber would pay for repairing the boundary wall; the PCC agreed. In the new Churchyard, the recent extension was to be subject to Tithe apportionment, which the PCC couldn't afford. By July, a special fund for rebuilding the Organ that John Simonds had primed with a donation of £100 had by then reached £455. The PCC debated the experimental siting of the Choir in the Chancel, but a majority preferred them to move back to the body of the church. The first hint that the Army Technical School had arrived at the Garrison was the PCC's offer to lend the School an old Lectern that was in the Reading Room. The War then intervened, and there was no meeting until March 1940. The Organ fund was not as large as previously reported, because provisional offers had later to be withdrawn due to the effect of the War. The Parish was unable to meet its full Quota payment to the Diocese, and only £16 out of £25 had been paid. The PCC proposed a vote of thanks to Col. Hood (C.R.E.) for his kindness in having the Electric Light batteries charged at Arborfield Grange. The Minutes of the Annual Parish Meeting at the Village Hall on March 28th 1940 gives a pen picture of life in the village with troops now stationed in the area. Church funds had been affected by some subscribers passing away and others moving away from the parish. Mr Allsebrook had resigned his long-standing Vice-Chairmanship of the PCC because he had moved away, while Mrs Stuart Rickman and Mr T H Allen had died. The Electoral Roll was now 142. There was a change of venue in May 1940, to the Arborfield Schools. Mr Bowyer had resigned as Churchwarden because he had to move away from the parish, and was replaced by Mr Verrall. New blood had arrived in the form of Capt. Peele and Mrs Newton, who were co-opted to the PCC. By 1941 the presence of the Army had boosted the Electoral Roll to 172. Practical matters included the donation of a stirrup pump by Mrs Prescott to deal with incendiary attacks on the church building. The Rector proposed making a photographic survey of the church interior in case of possible damage. It appears that there were no PCC meetings between April 1941 and March 1942. The April Annual Meeting thanked Mr George Bentley for re-charging the Electric Light batteries for free. They were now 5 years old, and in a poor state. New PCC members were Major Morris and Mrs Roche, and a very short PCC meeting followed the Annual Church Meeting, to cut formalities to the minimum. The same streamlining happened at the next PCC, which followed the 1943 Annual Church Meeting. The church was doing good work in the Schools, and in addition, the Sunday School was thriving, led by Mrs Roche with Miss Jervoise and Mrs Cox. The Old Church was suffering from burglary and theft; most of the panelling of the Conroy Chapel had been removed. To prevent further theft, the old Communion Rails and other woodwork had been taken to the Rectory for safety. The next PCC was after the 1944 Annual Church Meeting. By this time, the funds were in a satisfactory state. The Minutes were unusual in listing all PCC members and Sidesmen in full rather than 'en block' as reported for several years previously. Messrs. A Garrett, P Druett, Guy Bentley, F Edwards, P Mattingley, S Emblen, F Middleton, P Ayres, J Hunt, W Balcombe, J Watts, A Chambers and T H Clark - Sidesmen. John Simonds was Vice-Chairman, but his long-standing wish to give up being Treasurer due to many extra duties was finally granted; Mrs Prescott took over. Miss A M Edwards continued to serve as Secretary. By Autumn 1944, things were easing up, and there was a second PCC meeting, held in the Village Hall. The Chairman reported on the deficiency of the lighting in the church, and thanked an anonymous friend for repairing and charging three batteries. Looking towards the Post-War period, an 'Organ Renewal Fund' was proposed. The Annual Church Meeting in April 1945 reviewed the pattern of services, including maintenance of Evening Services throughout the winter (had these been curtailed because of black-out restrictions? ), and inclusion of A.R.P. workers among those marching at Parade services. Mr Simonds reviewed conditions in the East end of the churchyard, where some trees needed to be removed and many graves were neglected. It was proposed to level the neglected graves to ease maintenance. Canon Anderson expressed thanks to many members of the Council and the Church, including Mrs Roche, who had left the area. Mrs Elliot took over the Sunday School, while at the other end of the parish, Mrs Hall had started a Sunday School at her house. Finally, the meeting was told that Canon Anderson planned to retire, after being in post for nearly half a century. For a change, the PCC meeting took place on a different day, 11th May, and a different venue, at the Schools. No mention was made of the War, but of course its ending was a major reason for Canon Anderson retiring at a watershed in the life of both the Church and the School. "It is the earnest wish of the members of the PCC that whoever is appointed to fill the vacancy on the resignation of the Rev. Canon J A Anderson shall be primarily a moderate churchman, neither extreme high or low, and a married man under forty years of age if possible. He should be a countryman who will understand and appreciate country pursuits and interests; one who is definitely interested in the Youth Movement, and will be able to take an active part in the social activities associated with village life. He should be capable of teaching Religious subjects in the school, and possess a good ear for music". The July meeting discussed the year's Post War Appeal, and decided to aim to install electric lighting in the Rectory. No new Incumbent had been found, the biggest drawback apparently being the large and inconvenient Rectory. A special PCC meeting was called for September 21st to discuss a presentation to Canon Anderson of a wireless set; other money raised going to be spent on beautifying the interior of the church. Mr Stephen Emblen, the oldest parishioner and church worker, would make the presentation. A Ladies' Committee was appointed to arrange for refreshments. 1 To remove the organ from its present position in the Chancel and erect a new one on the West End Arch. 2 To utilise the space gained by enlarging the Vestry. 3 To raise the Altar. 4 To utilise the old Altar Rails from the Old Church. 5 To remove the bands of texts over the arches and windows. 6 The installation of Electric Light when available. The PCC met again on February 14th 1946 to hear that a Faculty was being raised to deal with the proposed changes to the Church. Also, the living had been offered to Rev. W Lindsay, and a reply was awaited. The PCC proposed to install Mains water and electricity for the Rectory. The 1946 Annual Meeting heard a proposal to divide the Rectory into two dwellings in order to make it more attractive for a new incumbent. More PCC members had left the parish, and Mrs Moore, Mrs Roche, Mrs Elliott and Miss Hainworth were replaced by Mr P Druett, Miss Hall, Mrs Edwards and Mrs Watts. "the tremendous loss the Church and Village had sustained through the death of Mr John Simonds - he had given so much of his time and energy to the affairs of the Church and Council, that one felt the loss was irreparable, but he would be remembered for the invaluable services he had rendered to the Church and parish". They stood in silence, after which they were able to record their welcome to the new Rector, who was to be Inducted on the 25th, and to plan the finer details of this Service. Another member was departing the parish: Mrs Prescott had been Treasurer, and she handed over to Miss Jervoise. After the Induction, there was another PCC meeting in November, when it was proposed to sell the Rectory and build a smaller one as soon as an opportunity arose. The Churchwardens had already signed up to the 'K2' scheme whereby the Parish topped-up the Rector's stipend by £50 a year, and this was ratified. The 1947 Annual Church Meeting elected Brigadier E W Chadwick as a new Churchwarden alongside Mr Verrall, though the Verralls were themselves about to move out of the parish, and a replacement would be needed soon. The meeting heard about progress in providing electricity and mains water for the Rectory. The electrical supply had been fitted in such a way that the building could be split into two dwellings. The requirements of the new Education Act meant that £2520 needed to be spent on the schools over the next 8 years. The Old Church was in a very bad state, and would fall into decay unless something was done to preserve it. The 1948 Annual Church Meeting revealed new plans for the Organ. The Standen Tomb had originally been placed under the Bell Tower, and it was proposed to move it to where the Sexton's seat was located to make room for the Organ. By June 1948, the PCC heard that Major and the Misses Simonds had paid for the Altar Rail to be installed, and that they wished to provide a new Altar complete with three frontals. The Wooden Font from the Old Church was being repaired for new use. Bearing in mind the impending heavy expenditure over the next few years, Mrs Simonds didn't think that this was the time to be thinking of a new pulpit, and the money should be diverted to paying for moving the Organ and the Wooden Font. The PCC also proposed to erect a memorial tablet to the Simonds family of Newlands who had been connected with the parish for about 600 years. The February 1949 meeting heard about the state of the Old Church. The chapels were to be demolished but the memorial tablets were to be preserved. In the new church, the old Stone Font was to be left in place even though the Wooden Font would be used instead. Messrs. Ayres, Guy Bentley, Andrew, Cox, Collis, Druett, Hunt; Mrs Aitchison, Ayres, Bentley, Capper, Day, Edwards, Hunt, Hall, Gutteridge, Simonds, Newton, Vickers, Watts; Miss Jervoise, Edwards - PCC. When the opportunity presented itself, the Church and Organ would be electrified; the Organ had been moved and it was now most satisfactory. The Old Churchyard was a sore point at the 1950 Annual Church Meeting. Apparently, residents of the camp in the vicinity of the Old Church were causing destruction to graves and stones. However, since the camp would soon be closed, the problem would soon go away [there were lines of Nissen Huts on either side of the approach road from Church Lane to the Old Church, and many of the inhabitants moved to the new 'Newland; estate when it was completed. The roads were to be named after Canon Anderson and Stephen Emblen]. The PCC had received authority to demolish the Old Church, but nothing was to be done before taking advice from the Church Architect, Mr Ravenscroft. PCC meetings during the year dealt with electrification of the Church and also the possibility of connecting to Mains Water, but in the event the existing pump was repaired instead. The Magazine was losing money, and it was proposed to have the local news typed rather than type-set. Education was on the agenda of the 1951 Annual Meeting. Although the PCC had wished for the school to become 'Aided', instead it was to be a 'Controlled' State school. For the first time in these Minutes, the subject of Parish boundaries was raised. For several years, the civil parishes of Arborfield and Newland had been joined as one, but the old ecclesiastical boundaries still ruled. People living at Arborfield Cross would be married or buried at Bearwood Church unless they were on the electoral roll of Arborfield Church [this boundary revision didn't take place until the late 1970's]. The PCC was informed at its January 1952 meeting that the Rector had been offered the living of Budbrook, so he was resigning as Rector of Arborfield. Although they had enjoyed close fellowship with their congregation, the Sparshotts found the Rectory too difficult to manage. The Rector singled out for special praise his Verger, Mr Cox, who lived in Church Lane. The School was now State controlled, but the School House and its sparse facilities - it had no bathroom - were still the responsibility of the Church Trustees. It was planned to hand the Trusteeship over to the Diocesan Board of Finance. The 1952 Annual Meeting had to face the news that Brigadier Chadwick was moving from the parish during the inter-regnum. Mr Foxton (who had recently sorted out the Parish Magazine's finances) took over the role. Also, Mrs Simonds announced her impending departure. A new face on the PCC was Stan Leach. The meeting agreed to hand over the old church records, some dating back to 1700, to the care of the County Record Office. The Bishop of Reading attended the next PCC meeting in July 1952 along with the temporary incumbent, the Rev. Sellars, who had been energetic during his short stay in the Rectory. The Sunday School had been boosted from 10 to 30 children through the assistance of Mrs Foxton and the Young Wives' Group. The Bishop reported that no-one could be interested to apply for a permanent living because the Rectory was far too large and expensive for any Rector. The next PCC meeting heard that a new Rectory was proposed on the Reading Road near Pudding Lane, and that an applicant, Rev. Bond, might become Rector if a new Rectory were being built. Tenants in the Rectory were causing difficulties by the January 1953 meeting. Because the tenants had nowhere to go, three potential incumbents had refused the living because the Rectory was still occupied. The 1953 Annual Meeting heard that the Bell Captain Mr Day had been called-up for National Service, and Laurie Hall had kindly taken over the small remaining team of six [Laurie remained in post for many decades, and the bell-ringing team was much strengthened during his time]. Major Williamson became chairman of the PCC. The troubled question of the Rectory occupied the July 1953 meeting. Consideration had been given to dividing the Rectory into two reasonably sized houses, one to be let. The Bishop of Reading had not at first approved of this plan, but was now won over along with the Church Commissioners. The scheme was agreed to, but a subsequent meeting was told that the Church Commissioners had not given their consent after all. Opinion was now divided both in the PCC and in the parish at large as to the desirability of splitting the Rectory. The December meeting was also concerned with the future of the Rectory. A typewritten report on the proposed conversion of the Rectory into two semi-detached houses, with garages, stores, etc., was attached to the Minute Book. In summary, the existing Rectory was an 'L' shape of 4,670 square feet on two floors, and could be split into one of 2,688 square feet and one of 1,982 square feet. The separation would consist of bricking up three doors. The larger dwelling would form the Rectory, with the dining room reduced in size to allow for a new entrance lobby. The five bedrooms would be reduced to four, plus a new bathroom and WC. In the smaller dwelling, there would also be four bedrooms plus a bathroom. The garage would be split, with the first-floor storage going to the Rectory. Some loose ends would need to be dealt with. The new tenants must be carefully selected. Also, the Rectory Paddock might be disposed of. It was currently in use by Mr Lee for keeping pigs. The meeting agreed to go ahead with the proposed split, but would record the unanimous opinion that the PCC would have preferred a new Rectory if this were practicable. A new name appeared in the December meeting. Mrs Canham of Greensward Lane was thanked for playing the Organ during the illness of the Organist. [Allan and Margaret Canham were later to serve the parish over many years both on the PCC and the Parish Council before retiring to Lincolnshire in the late 1980's]. The organist, Mr Collis, had died before the April 1954 meeting, and the PCC mourned their loss. Mr Bunce was found to replace him. It was recorded that the fact that he lived in the Parish in addition to his skills both as Organist and Choirmaster caused the PCC to approve his appointment unanimously. The 1954 Annual Meeting had cause to thank the Revs. Wickstead and Hinton for their services during the year, and also to Mr Foxton in his duties as Sequestrator over the future of the Rectory. Mrs Hall was no longer able to serve on the PCC due to ill-health, and proposing that Miss Hall could take her place [Miss Hall served as a Sunday School Teacher for four decades]. Work was proceeding well on the Rectory sub-division. No tenant had been found, and it was felt that if the two dwellings could be completely separated, than the new Rector need not have to be consulted over the choice [The Rectory and Rectory Close are still to some extent 'Siamese Twins', since no satisfactory way was ever found to divide the drive and the frontages]. The Meeting also heard that Mr Andrews, member of the PCC and also Headmaster of the 'Newland, Arborfield and Barkham Schools' was due to move away from the parish, which would be a great loss to both organisations. However, in April 1955, the 1954 Minutes were signed by the new Rector C Hamilton Wilson, thus resolving the Inter-Regnum of nearly three years.